Bed Bugs On Mattress – What To Do Now? Bed Bugs On Mattress - What To Do Now? Why Do They Get On It? The simple answer to this question is -- because they like to live near their hosts. After bed bugs enter your home, they find the place you spend the most time at. Which is your bed, at night. One or two -- bed bugs can burrow inside of your mattress and come out at night to feed on you, every ten days. But when one lays eggs and they hatch, their number grows, and they will spread out in other places of your room, and cause an infestation. How Do They Get On It? Well, bed bugs can't fly or jump, they crawl to your bed. Bed bugs are drawn to carbon dioxide and that's how they find you. When you sleep at night, you don't move a lot, and the carbon dioxide that you breath out forms a cloud over your bed. Thus, the bed bugs know that there's food there and crawl to your bed. You will need a pair of medical gloves, a flashlight and something flat and stiff, like a credit card, scraper, hard paper. First, inspect your bed linen because you may spot blood stains on the sheets. Then strip the mattress and using the flashlight start checking it carefully. Red stains may be visible on the mattress, too. Excrements from bed bugs, which look like small dark spots, you can try and scrape them off with the flat object. Tiny white eggshells or yellow skin shed from the nymphs. Cordings of the mattress on both sides, especially the corners. Under the mattress tag; some old mattresses have buttons, check them too. 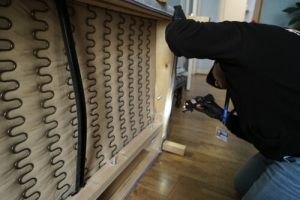 Check the box springs: remove dust cover and inspect the inside of the box springs. Inspect small cracks where pieces of wood or plastic (the material your bed frame is made of) do not fit well together and leave some space. The headboard and hanging pictures, too. Check the folds, seams, and tufts of your mattress and box springs, where the fabric is stapled to the wood. You don't have to. It won't make the problem disappear. Even though many people think that getting rid of their mattress means getting rid of the bed bugs as well - they are wrong. Don't you be fooled by the name "bed bugs" too, and think they are only found in your bed. They can be in wall crevices, on the carpet, sofas or couches, behind picture frames or nightstands, near the wardrobe. You can get an active bed bug infestation even after throwing your mattress away. Bed bugs can lay about 20 eggs a day and it only takes them a couple of days to hatch. Getting rid of it will only cost you money. A new mattress will get infested soon afterwards if you don't treat the area. Furthermore, after getting rid of your mattress you'll have to sleep in another room until you buy a new one. Don't! That's a great way to spread the bed bug infestation in the rest of your home. They can hitchhike on you or your bedding and move to another room where they will begin feeding and reproducing, and cause an infestation. Sometimes the infestation can get massive before you discover it and begin a treatment. In those cases, if the mattress is incurable it should be thrown away. If that's the case with you, you have to make sure you are not breaking any laws, check the waste regulations. - You can call a junk removal service and hire people to dispose of it. - If you are allowed to leave your mattress on the curb, make sure you make clear that the mattress is not to be taken by a person. 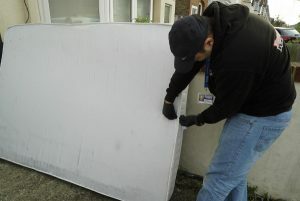 - Encase the mattress in a strong plastic cover to stop the bed bugs from spreading once your mattress is outside. They can move to your neighbours or get on people passing by. - If you deem necessary, leave a note saying that the mattress is infested and must be thrown away. What to Do in Case the Mattress Is Infested? Bed bugs infestation is one of the hardest problems to deal with, even to professional pest exterminators. There are some things you can do on your own to treat your mattress and get it free from bed bugs. However, you are more likely to only slow down the growth of the infestation and not to eradicate the problem completely. *Keep in mind that the The British Pest Control Association, advises to NOT DIY a bed bug infestation if you don’t have the knowledge to do so, but to call professionals. Clean your bed linen, place pillowcases, sheets, other covers, duvets, in a garbage bag and seal it tightly. Carry them to the washing machine. Use the highest temperature that is suitable for the fabrics you are washing. If you own a dryer, use it too. Bed bugs and their eggs die at high temperatures. Heating up the mattress is a successful way to rid it of bed bugs and their eggs. You can borrow, rent or buy a heat steam cleaner and attempt to drive the bed bugs off the mattress on your own. If the machine can reach up to the high temperatures necessary for bed bug treatment, you might even be able to kill the eggs as well. This method is slow and requires a lot of your time and patience to go over every centimetre of the mattress. However, if you decide to use a professional heat treatment against bed bugs for your home, the mattress will be treated along with other affected areas and items in the room. Some people believe that by vacuuming the bed bugs kills them. Not true! Vacuuming the bed bugs won't kill them, it just collects them inside of your vacuum machine. You will only decrease their population for a period of time. If no adequate treatment is applied, the infestation can rapidly grow again. You will need to remove the vacuum bag and seal it in a plastic bag, and dispose of it in a container outside of your home. The fact that you've found bed bugs only on your mattress doesn't mean they aren't hiding in other places in the room. Washing the bed linen on high degrees, heating up the mattress and vacuuming are just temporary measures. To get rid of bed bugs once and for all, you'll need effective bed bugs control done by professionals with the right chemicals. Diatomaceous Earth is a DIY method often listed as an effective one. However, it has been proven already that DE actually does nothing to eliminate bed bugs. Silica gel, boric acid - both are similar in usage and in expected results. Silica gel is said to be more effective than boric acid, but it is not a way to get rid of bed bugs infestation alone. Rubbing alcohol can be used to kill bed bugs. However, the problem is that it needs to be used in big quantities in order to work on your mattress or bed area. This will make everything around the bed highly flammable and put your home at risk of fire. Pesticides and bug bombs sold in stores aren't as effective as you may think. The majority of products sold to you to treat bugs are not nearly as strong as they should be. This makes them ineffective and you're just wasting your time and risk spreading the bugs in more areas of your home. Using a mild pesticide will scare them off in a different direction and they will seek shelter in other rooms or pieces of furniture. Encasement of the mattress and box springs. This is done with the end goal to starve and kill the bed bugs, some products may help speed up the process. It will also take a very long time, and it still doesn't guarantee the extermination of bed bugs and their eggs. You can pick up bed bugs from anywhere if you are not being careful. Even luxurious hotels are not bed bugs-free zones, neither are motels, taxis or aeroplanes, hospitals, buses, etc. Some DIY methods and postponing the professional help may result in an infestation that is too big and you have to get rid of your carpets or furniture. If your own methods of preventing and dealing with bed bugs don't prove to be effective, do not waste much time before calling the professionals. Found some bed bugs on your mattress?